A re-launchable rocketship that shuttles passengers between far-flung destination (like New York and London) in well under an hour. A manned lunar mission involving civilians orbiting the moon by 2018. A cargo mission to Mars by 2022 and a manned venture to the Red Planet by 2024. Ultimately, Musk envisions colonizing Mars and sending about 100 people per rocketship to a base there. Elon Musk founded SpaceX in 2002 with the goal of making humans an interplanetary species. Some of his most ambitious aims, which have included plans for a gargantuan spaceship that most critics insisted were totally unrealistic, have been scaled back in recent years. But there is little doubt that Musk’s private aerospace company has managed to change the trajectory of the entire industry. 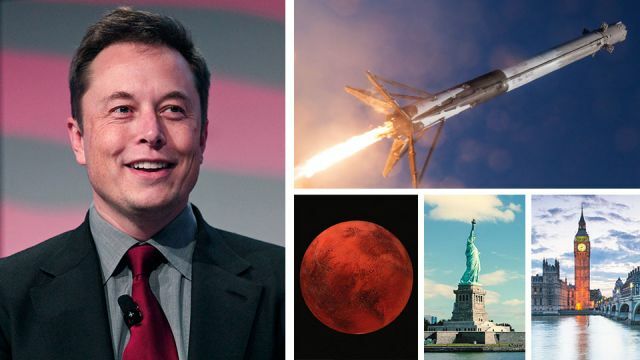 His firm has been awarded about $4 billion in contracts from NASA and it is responsible for shuttling cargo to and from the international space station. In 2018, SpaceX is expected to fly astronauts to and from there as well. Currently, SpaceX has gotten very good at landing its current generation of spacecraft (called the Falcon 9) on both land and sea. But at the International Aeronautical Congress, Musk talked about a new type of re-launchable vehicle, which he’s calling Big F**king Rocket (or BRF for short). He foresees these crafts as blasting off from water-docked launchpads as they ferry commuters briefly into orbit before the vehicles re-enter the earth’s atmosphere and touch down in a distant city. Musk also outlined plans to return humans to the moon. In July, the SpaceX CEO said his company was determined to fly two civilians into a lunar orbit before the end of 2018. At that time, he also reiterated his commitment to building a lunar base. At Friday’s conference, Musk made it clear that Mars was his ultimate objective. His goal of launching a cargo mission just five years from now (and a manned mission by 2024) struck many observers as optimistic, to say the least. After all, the Red Planet is 35 million miles away (at its closest) and experts insist that enormous technological hurdles have yet to be worked out. Nevertheless, on Thursday, Lockheed Martin — a SpaceX rival —– unveiled a plan for a huge space laboratory, which would orbit Mars. Musk’s optimistic projections came as the space race is heating up. Russia and China have both signaled that they are planning lunar missions in the near future. Meanwhile, other notable entrepreneurs (like Jeff Bezos) are trying to blaze new trails in the industry too. Hey @elonmusk will weed be legal on Mars? Would you book a flight on one of Musk’s BFRs? I’d love to hear your thoughts. Let me know in the comments section below. Hey Buddy!, I found this information for you: "London To New York In 30 Minutes? Elon Musks Says It’s Possible". Here is the website link: https://www.thealternativedaily.com/elon-musk-unveils-new-vision-for-space-travel. Thank you.